“Harmless as a flea” may be a common expression but, unfortunately, fleas are not entirely harmless. At the very least, a flea bite will cause an animal to scratch. Because one flea is just a sign of many fleas, animals typically get multiple flea bites, which causes even more scratching. You may not think a few flea bites amount to much, but they can be a source of your pet’s constant scratching. If this scratching continues, the flea bites can become infected, and lead to a skin condition called flea allergy dermatitis. A report by CNN indicates flea allergy dermatitis is a growing problem for pets. Flea bites are considerably worse if the dog or cat is allergic to the flea’s saliva. According to Sandra Diaz, an assistant professor of dermatology at the Virginia-Maryland Regional College of Veterinary Medicine at Virginia Tech, the most common form of allergic reaction in dogs is to flea saliva. In smaller sized animals such as puppies, and sometimes in young children, fleas can actually cause anemia. The host loses blood through the flea bites and excessive scratching and becomes anemic. Anemia is a serious condition if it remains untreated. Dogs and cats can scratch flea bites until they bleed and even become infected. This just makes it easier for fleas to get more blood from their victim, so it really is a vicious circle for an untreated animal. One effective natural remedy for flea bites, which soothes and heals the flea bites themselves and helps prevent fleas from returning is neem oil. Neem oil is derived from a plant widely used by native Americans. When diluted with water and mixed with vinegar, neem oil can be applied directly to an animal’s skin. 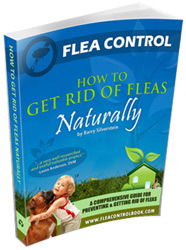 More information about flea allergy dermatitis and natural, safe, effective methods and substances you can use to control fleas is available in Flea Control: How to Get Rid of Fleas Naturally. I have been searching everywhere for accurate information about this, thanks. The wordpress theme that you are using is great too, I would be interested in getting hold of it if possible. I’m not so sure the Neem oil is a good idea. I called the manufacturer and they said, do not use it on animals who will lick it, or lick their fur…it’s not to be ingested. I don’t know of a dog or cat who wouldn’t lick their fur, in fact, that’s all they do. Incidentally, you can give your pet “Rescue Remedy” which I get from the health food store. I give my cat 2 drops twice a day. This will calm them.